Southend-on-Sea ( ) is a seaside resort town and wider unitary authority area with borough status, in Essex, England, on the north side of the Thames estuary 40 miles (64 km) east of central London. It is bordered to the north by Rochford and to the west by Castle Point. It is home to the longest leisure pier in the world, Southend Pier. London Southend Airport is located 1.5 NM (2.8 km; 1.7 mi) north of the town centre. Originally the "south end" of the village of Prittlewell, Southend was originally home to a few poor fisherman huts and farms that lay at the southern extremity of Prittlewell Priory land. In the 1790s landowner Daniel Scratton sold off land either side of what was to become the High Street, and the Grand Hotel (now Royal Hotel) and Grove Terrace (now Royal Terrace) were completed by 1794. Due to the bad transportation links between Southend and London, there was not rapid development during the Georgian Era like Brighton. It was the coming of the railways in the 19th Century and the visit of Princess Caroline that Southends status of a Seaside resort grew. 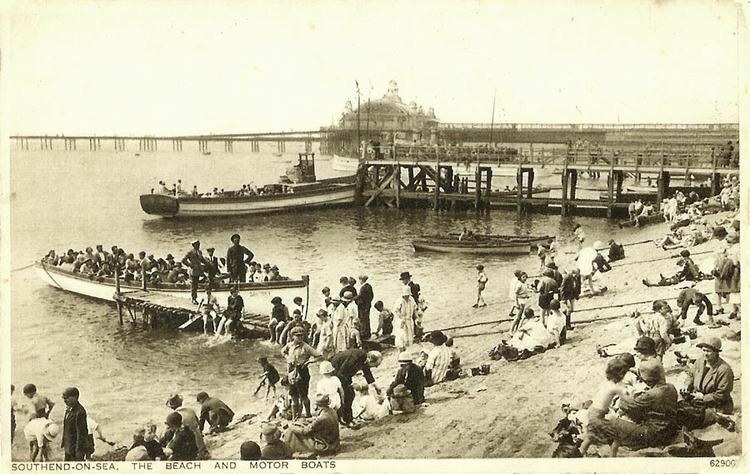 During the 19th century Southends pier was first constructed and the Clifftown development built, attracting many tourists in the summer months to its seven miles of beaches and bathing in the sea. Good rail connections and proximity to London mean that much of the economy has been based on tourism, and that Southend has been a dormitory town for city workers ever since. Southend Pier is the worlds longest pleasure pier at 1.34 mi (2.16 km). It has suffered fires and ship collisions, most recently in October 2005, but the basic pier structure has been repaired each time. There has been significant loss of pier-head facilities since the major fire in 1976. Southend went into decline as a holiday destination from the 1960s, when holidays abroad became more affordable. Southend reinvented itself as the Home of the Access (credit card) due to it having one of the UKs first electronic telephone exchanges (it is still home to RBS Card Services - one of the former members of Access), with offices based in the former EKCO factory, Maitland House (Keddies), Victoria Circus and Southchurch Road. Since then, much of the town centre has been developed for commerce and retail, and during the 1960s many original structures were lost to redevelopment - such as the Talza Arcade & Victoria Market (replaced by what is now known as The Victoria shopping centre) and Southend Technical College (on the site of the ODEON Cinema). However, about 6.4 million tourists still visit Southend per year, generating estimated revenues of £200 million a year. H.M. Revenue & Customs (HMRC), (formerly H.M. Customs and Excise), are major employers in the town, and the central offices for the collection of VAT are located on in Alexanda House on Victoria Avenue. The University of Essex, Southend Campus has been developed locally to provide higher education facilities and to assist in boosting the economy. Southend also has over 80 parks and green spaces and 14 conservation areas. Southend-on-Sea is home to the worlds longest pleasure pier, built in 1830 and stretching some 1.33 miles from shore. Since 1986, a diesel-hydraulic railway has run the length of the pier, replacing the electric service which opened in 1890. The pier has been beset by fires; a fire in 1995 destroyed the bowling alley at the start of the pier and another fire in October 2005 damaged the far end of the pier. The pier was also run through by a boat in 1984. The cafe at the end of the pier has been used by Jamie Oliver for his series Jimmy and Jamies Friday Food Night. The British record shore-caught Norway haddock(Sebastes viviparus) was caught from Southend pier by F.Fawke in 1973. An airshow, dubbed Festival of the Air in 2009, use to place each May. Starting in 1986 – the first show starred a Concorde flypast whilst on a passenger charter flight – the show was one of Europes largest free airshows and features high-speed military jets and sports aerobatic displays, which fly over the sea, parallel with the seafront. The RAF Falcons parachute display team and RAF Red Arrows jet aerobatics team were regular visitors to the show. The show has not been run since 2012 due to lack of sponsorship, however is due to return in September 2015 as the Southend Airshow and Military festival. Each August Southend Carnival opens along the "Golden Mile" with the lighting of the Southend Illuminations. The Southend-on-Sea Film Festival is an annual event that began in 2009 and is run by The White Bus who are based at TAP, Old Water Works in Southend. Ray Winstone attended the opening night gala in both 2010 and 2011, and has become the Festival Patron. The films shown are a combination of world cinema, independent cinema, documentaries, childrens films, sing-a-longs, popular classics, and British noir. The Festival usually takes place over 5 days in spring, at the Palace Theatre, Park Inn Palace Hotel, and the Southend Central Museum and Planetarium. Fringe events including musical performances take place at a variety of locations in Southend. Leigh Folk Festival is a three-day event each summer in Old Leigh, featuring live music by the sea. Leigh on Sea Fishing Festival is held in Old Leigh and is organised by local fishermen. It provides an opportunity to see the port in action and taste the local catch. Old Leigh Regatta was re-established in the 1970s and takes place every September, with each race started by a miniature cannon made at the old Leigh Foundry, now home to the Lynn Tait Gallery. Focal Point Gallery is South Essexs gallery for contemporary visual art, promoting and commissioning major solo exhibitions, group and thematic shows, a programme of events including performances, film screenings and talks, as well as offsite projects and temporary public artworks. The organisation is funded by Southend-on-Sea Borough Council and Arts Council England. Southend Museums Service, part of Southend on Sea Borough Council, operates a number of historic attractions, an art gallery and a museum in the town. These include: The Beecroft Art Gallery, Southchurch Hall, Prittlewell Priory and the Central Museum on Victoria Avenue. Leigh Art Trail began in 1997, and each year local artists display their work at a variety of locations through Leigh Broadway and in Old Leigh. Westcliff Art Trail began in 2008 and follows a similar format to the Leigh Art Trail, with local artists showcasing their work in Westcliff shops, cafes and bars. The TAP Gallery operates in North Road, Westcliff in the former Victorian water works building. TAP stands for Temporary Arts Project and is a not for profit organisation formed in 2008. It holds art exhibitions, talks and workshops. Southend has several small libraries located in Leigh, Westcliff, Kent Elms and Southchurch. The central library has moved from its traditional location on Victoria Avenue to The Forum in Elmer Approach, a new facility paid for by Southend Council, South Essex College and The University of Essex. It replaced the former Farringdon Multi Story Car Park. The old Central Library builidng has now become home to the Beecroft Gallery.